The essential guide to world soccer—the history, the players, the fan culture—from the phenomenally popular duo from NBC Sports. The Men in Blazers are two English-born, soccer-obsessed broadcasters who have savored the dizzying growth of the game along with millions of Americans. 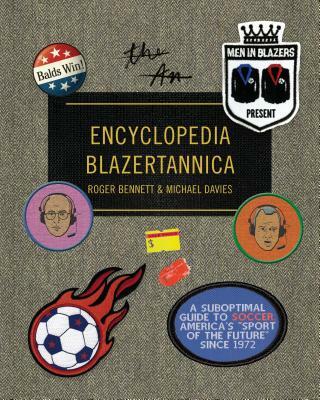 Now they immerse fans and novices alike in the history and culture of the world’s game with Encyclopedia Blazertannica. Examining fan culture, from the famous stadium chants to the tactical variations of scarf tying, exploring the complex physics and ethics of both celebratory knee slides and fights between players, reliving the careers of legendary players, classic matches, and colorful World Cup history, and sharing a deep appreciation for the athletic brilliance and ill-judged neck tattoos that dominate the sport, this indispensable tome gives readers a front-row seat to all the action of football madness. ROGER BENNETT was born in Liverpool and moved to the United States after university, under the thrall of Ferris Bueller, Hart to Hart, and Diff'rent Strokes. A writer, broadcaster, and filmmaker, Bennett began at ESPN and moved with Men in Blazers to NBC Sports to become the go-to interviewer for the biggest names in soccer, making films with the likes of Jose Mourinho and Pep Guardiola. MICHAEL DAVIES was born in London and educated in Scotland and the United States. For twenty-eight years he has worked as a television executive and multiple Emmy Award winning producer of many shows, including Who Wants to Be a Millionaire. Davies started writing for ESPN.com in 2002 before partnering with Bennett on Men in Blazers in 2010. In addition to their podcast and television show on NBC Sports, the duo have a weekly show built into the phenomenally popular EA Sports FIFA game, and have developed a large live following.